Notes in brackets are available on the small-bore Kingma System bass flute but may vary according to the instrument used and the player. The bass flute sounds an octave lower than written and is notated in the treble clef. It is not a true bass instrument, in the sense that most of its range lies above middle C. The size of the instrument means that it requires considerable amounts of air to play, so the dynamic range is limited. This Kingma System upright bass flute has a low B footjoint, similar to that which is often found on the C flute. The upright design particularly accommodates the extra weight created by the additional length of the tube and its extra keywork. The B footjoint makes the response slightly slower than a C footjoint would, due to the length of the tube, but the advantages in terms of extended techniques, and the harmonic series from low b (which can also be heard in a rich multiphonic), in addition to the extension of the range, makes it entirely worthwhile. Playing the b creates a considerable strain for the right hand little finger, as three keys have to be held down simultaneously with one stretched finger. d sharp', c sharp', c' and b are all produced through the use of the same finger, so rapid movement around these notes should be avoided, as should extended passages using these pitches. The upper range of the bass flute is variable according to a range of factors, including the bore size, the headjoint design and the skills of the individual player. The highest pitches are likely to have limited dynamic control, and use a large quantity of air, so cannot be sustained for long periods. On some instruments, individual notes in the high register may be more difficult to sound than others. A common example of this is high e''', which may sometimes requires additional venting through, for example, partially opening one of the the trill keys, in order for the note to sound clearly. 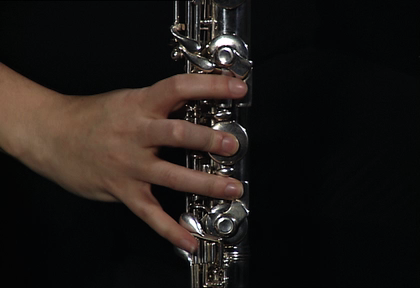 The bass flute's high register has a tendency to be airy in tone, and intonation can be difficult to control.